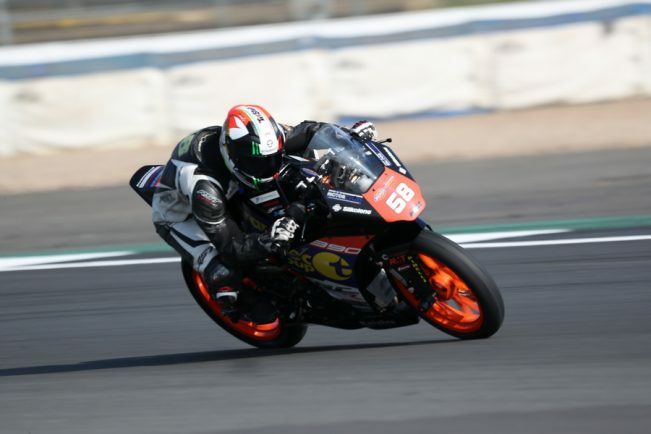 TRANSMEC KTM junior team rider Trystan Finocchiaro enjoyed a very positive test at Silverstone as he dipped under the previous lap record on his first ever visit to the circuit. Making his debut in the British Superbike paddock ahead of the Junior BSB campaign, Finocchiaro worked tirelessly throughout the test to learn the circuit, improve his bike set-up and enhance his pace. Making improvements throughout the day, the Anglo-Italian made one final push in the last session to join one of five other riders under the previous lap record and become the only KTM rider to do so as he finished the final session in fourth place. “This is very positive for us, we have done everything we needed to do and can now go into the round one fighting for the win,” explained Finocchiaro. With a change in regulations coming before the first round at Silverstone, Finocchiaro believes the changes will work in in his favour on board his KTM RC390R. He added: “They’re restricting the Kawasakis and bringing the Yamahas forward. This will only make the racing closer and also work in our favour as our bike will be the only one that won’t have been changed, so we know exactly where we are for round one.